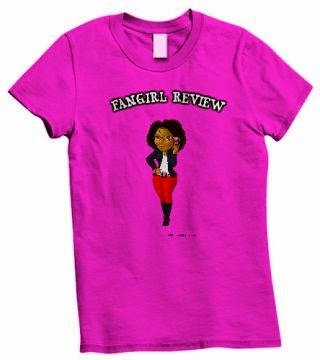 Fangirl Review: Recap: The Walking Dead S7, ep. 3 "The Cell"
Recap: The Walking Dead S7, ep. 3 "The Cell"
Recap: Story starts with Dwight sitting watching an old episode of "Who's the boss". There is a montage of him doing little things. He goes about his life and is making a breakfast sandwich with stuff that he has taken from other people. Real time Dwight finds himself watching a walker that is stuck but keeps trying to get up. He goes to visit Darryl and feeds him a sandwich made with dog food. Daryl is naked and being kept in a dark room. You can tell that the isolation is starting to get to Daryl. There is a constant annoying music that would drive anyone insane. Dwight finally takes him out and to the doctor. The girl (Sherry) that was originally with Dwight is there and Dwight tells her not to talk to Daryl. There is a pregnancy test that is negative. Negan shows up wanting to talk to Dwight. Dwight takes Daryl outside to see the gauntlet of walkers and lets him know that he has choices to be like the workers, to be like the walkers, or to be like him. Daryl is staying strong and refusing to give in. Negan and Dwight talk about working on breaking Daryl. Negan picks at Dwight and questions why he is saying no to picking any woman he wants to sleep with. Dwight gets called to find someone who was stealing. There's a different guy feeding Daryl. He closes the door but Daryl realizes that it was not locked. You see Dwight making his way down the road and comes across a bunch of walkers. He finds himself in a bad situation. Sherry finds Daryl and tells him to just go back and to accept his fate but Daryl continues on and finds himself surrounded by Negan and his men. Negan proceeds to ask all the men, "who are you" and they all answer Negan. Negan gives him options for how he wants to survive in the compound. Negan goes to hit him but Daryl does not flinch and keeps giving him a good stare. Negan walks away while the rest of the men jump Daryl. 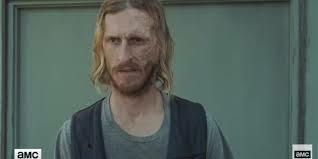 Dwight continues up the road and finds the guy he was looking for fighting with a walker. 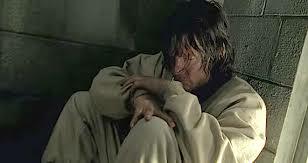 Daryl is back in his cell. Sherry talks to Daryl and says that she is sorry. The guy with Dwight says to just let him go but Dwight responds that he cannot. The guy says it is okay to kill him. The guy gets down on his knees and keeps saying it is okay. Dwight begins to threaten him and the guy says fine and gets up and starts walking. Dwight gets a crazy look in his eye and then shoots him in the back. Dwight returns back and runs into Sherry (his former wife) in the stairwell and asks for a smoke. He asks if Negan is good to her. She asks Dwight if he is happy. We go back to Daryl in his cell and the annoying music. Dwight opens the door and Daryl turns away from the food. 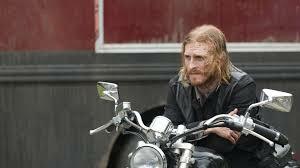 Dwight lets him know that Negan has taken a shine to him and that he is lucky. Dwight tapes a pic to the wall. The music starts up again and you see Daryl start to cry. He is finally broken. Dwight listens and then walks away. Dwight opens the door and sees Daryl laid out and puke by him. Dwight brings Daryl to see Negan. Negan tells of how Dwight had taken off with the two girls and how they are rules. Tells of how Dwight came back and asked for forgiveness. Dwight was going to be killed and Sherry offers to marry him instead. Dwight's face got burned and that is how he was welcome back. Negan says he thinks Daryl can be that type of guy. Negan says that he can have everything Dwight has if he answers the question, "who are you?" Daryl responds with his name. (ha! take that). Negan tells him he made a dumb choice and ends up thrown back into the cell. Daryl finally talks and says he understands why Dwight gave in and says that is why he cannot give in - they are both thinking about someone else. Dwight goes and looks at the fence of walkers and sees the guy that he shot in the back. Fangirl Thoughts: This episode is one of those episodes that you should watch on DVR so you can fast forward because I am bored and ready for the episode to be over and it is 45 minutes into the episode at this point. I think the story of what happened to Dwight's face could have been done better. The impact was not there like it should have been. Oh well, what did you think? what was on that picture?>?? ?